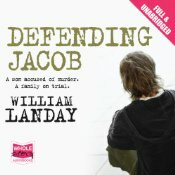 DEFENDING JACOB is narrated by Andy Barber, a 51 year old assistant District Attorney in Newton, Connecticut. When a teenage boy and classmate of Barber’s son Jacob is murdered on his way to school one morning Barber leaps into the investigation. After a slow start, largely due to a lack of cooperation from the high school students who were friends and classmates of the victim, seems to point in the direction of a local man who has been accused of indecent assault. But while Barber pursues that line of investigation other players in the Newton law enforcement community are chasing a different suspect: Barber’s own son. When they believe they have enough evidence they confront Barber and issue an arrest warrant for Jacob. What follows is an accounting of Jacob’s trial and the impact it and the surrounding media and social scrutiny all have on the Barber family. From a storytelling point of view I found the book uneven. The title tells us that Jacob is going to need defending so I was waiting for that point from the very first sentence and it seemed to take a heck of a long time to get there. Once we got to what I thought of as the starting point the book did pick up pace and drew readers into the familiar but nevertheless compelling consideration of whether or not Jacob was innocent but would be locked up or was guilty but would be set free. The depiction of the teenage social scene was a particularly successful aspect of the book. However I could have done without the major plot line revolving around the notion of an inherited propensity towards violence. It is a theme that has been explored many times over and while that in itself is not a reason to avoid it forever more I didn’t think it added anything to this story which dealt with the issue in a fairly superficial and uninteresting way. It felt like it had been added for shock value as no one, least of all the characters who were meant to, seemed to have any real convictions about ‘the murder gene’ notion one way or the other. As far as individual characters go the book is a miss for me. It’s not so much that none of the three family members is particularly likeable or sympathetic (though they’re not) but that I didn’t find them to be very strongly drawn on any scale which made them insipid. Worse though is that they did not seem very credible, especially the mother. Her husband describes Laurie as a warm, outgoing person with many friends and a strong connection to her community and her own family. Yet she totally withdraws from her parents immediately and every single one of her so-called friends abandons her (again with immediate effect). Even I, anti-social introvert that I am, could drum up one or two good friends who would stand by me in a crisis so I found it a stretch to swallow that she would not have had one person who stood by her in the horrific circumstances. Nor did I believe she would withdraw so immediately from her own family. The depiction of Andy’s development of highly disparaging views on the legal system he had worked his whole life in also failed my ‘ring of truth’ test. For me both of these things would have felt more realistic if they’d been depicted as happening more gradually than both parties having woken up the day after Jacob’s arrest with an entirely new set of beliefs and behaviours from what they’d had the day before. As a collective character though the Barber family and its implosion is the best aspect of the book for me. I didn’t hate this book but nor did I love it and on balance there were more niggly bits than there ought to have been. Even the editing seemed to have missed some continuity issues such as the fact that Barber tells us the man who prosecuted Jacob’s case went into private practice following the trial yet he appears to be questioning Andy in a subsequent grand jury investigation (transcripts of which pepper the entire book). Personally I wouldn’t recommend this book but having looked around at reviews it’s clear I am in the minority so, as always, you should make up your own minds. If you are an audiobook devotee you could do far worse than listening to Eric Meyers narrate it as I thought he did an excellent job. This entry was posted in book review, USA, William Landay. Bookmark the permalink. Thanks for your honest review Bernadette. Don’t know yet if I’ll read it, but maybe it’s not at the top of my list. Sorry you didn’t like this (as much as I did), Bernadette. I very much like legal/courtroom novels so perhaps my tolerance is higher. I rather liked the writing style and the way the problem was addressed – but, each to her own as far as reading tastes are concerned, of course. The cover you show here, and the US cover, are so much nicer than the horrible UK cover – a close-up of a demonic young child’s face. I must admit legal books are probably not my favourites though there are some I have enjoyed…but it was my book club’s choice this month so thought I may as well give it a go. I thought if they’d just stuck to the family and the trial it would have been better but hey I’ve never written a book so what do I know. I agree the cover of the UK (and Australian) version is awful – I’m sure that was part of what put me off deciding to read it in the first place as it is heavily promoted here and that horrid child’s face is everywhere – which apart from being awful to look at kind of gave the game away from a plot perspective. Exactly. A ridiculous choice for the cover. Sorry you weren’t thrilled with this one. I also listened to the audio book, and loved it…..especially the ending. Bernadette – Sorry to hear you didn’t like this book more than you did. Your review hit on two things I don’t much care for in books: Characters who react in unlikely ways given what we know of them, and themes woven into stories that are just there for the shock value. On the other hand, I respect authors who depict teen social life in a credible way. I’m not sure I’m going to read this one; I’ve read positive reviews of it and a few that are quite negative. Thanks for adding your insights. You’re not alone in not really loving this book. Andy bothered me more than Laurie: I understand being in denial re: his son, but he was majorly in denial. Different types of jars terms work for different readers, I think. Glad I’m not alone Rebecca…and Andy bothered me too for his being in denial and his blase acceptance of his father’s actions…none of it terribly convincing for me. I’ve heard a lot about this book but not really one for me as i don’t like legal thrillers. Interesting to read a less than glowing review. I like legal thrillers, especially if the courtroom dialogue crackles. I cut my teeth on legal mysteries, starting with Perry Mason, while in my teens and have always liked the genre. I don’t know about the courtroom scenes but I’ll give it a go at some point. Always interesting to read different opinions and tastes. While it WAS a page-turner, I also felt the characters as being somewhat underdeveloped and unbelievable. The description of Jacob’s earlier years and his “mean” behavior to other children and the dog should have been a clue to the parents that their son needed help. The parents couldn’t have been quite so clueless about early signs. Schools, teachers, other moms, etc all weigh in on a child’s character. We do not live in a vacuum. Yes Raye I thought they seemed quite clueless for modern parents, I could imagine one or other of them sticking their head in the sand but not both. Our book club found Defending Jacob to be a wonderful book discussion book. So much to to talk about and a real page turner! At least it’s a good choice for book club discussion Teresa as it does seem to generate different reactions – there’s nothing worse than a book club book which doesn’t get much reaction at all. Hope you enjoy your book club experience even if you don’t always like the books (half the fun is the arguing I think).